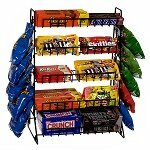 Pack a punch with this Double Wide Double Sided Candy Rack! 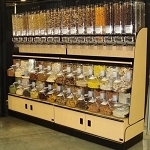 Built with up to 16 various sized metal shelves and peg style display hooks so you can show off prepackaged treats like peg bag candy, boxes of chewing gum, carded jewelry all on one exhibiting stand. Load up the candy rack with a huge range of sweet and salty treats and customers are sure to stop and load up each time they walk by. Offer both healthy morsels and guilty pleasure items on this double wide metal snack stand and draw in double the sales from those last minute impulse buys. 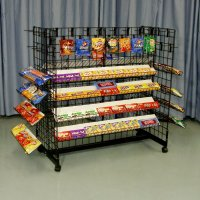 Order your double sided candy rack today!